I am finally spending some much needed time in my craft room! Shane is moving out tomorrow, and today I ran some errands to pick up those last minute needs for his apartment. Last night he told me that he would miss our Brita water container in the fridge, so of course, I went out to buy him a Brita pitcher. And I think I've got him stocked up on groceries for a bit. All I can say is I am Mom, and this is what I do! All right, down to business. Have you been over to Operation Write Home Stars and Stamps? They have an awesome blog hop going on right now, and I know that you will enjoy it. They are also doing a call for cards, and you can find more information by clicking on the red, white, and blue button on my right sidebar. This card I made today is using their weekly sketch. 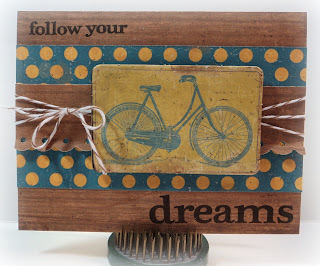 I've made it clean and simple for the Secret Crafter challenge and added twine for Crafty Ho's. I'll be using this for a graduation card. It's masculine as is, but I was thinking that if I added a flower to the bicycle, it would work for a girl, too. Greattake on this week's OWH sketch. 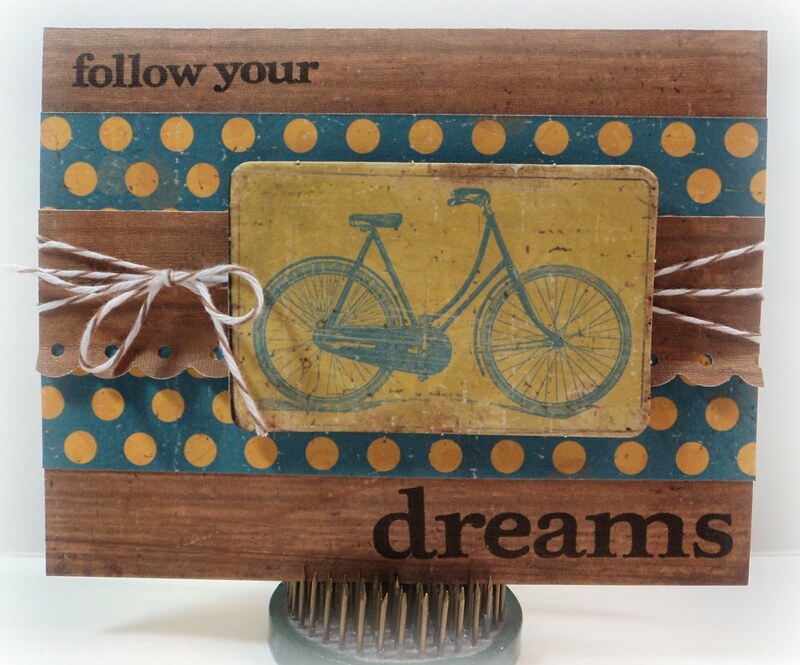 I love the bike image and the twine. It's a great card! This is such a fabby card! Great card, Brenda! I love that bike image and those polka dots. Thanks for joining us in this week's OWH Stars & Stamps Sketch Challenge! I love how you added the sentiment to this great card! Awesome colors and design! Great card. It works so well for a graduation card. Thank you for sharing. This is a wonderful bicycle card. We ride bicycles in our family and I know my husband would really enjoy it. Great imagination with the OWH sketch. Blessings. Fab card, Brenda! That does it--I have totally flipped for baker's twine and must get some, lol! Your card has a beautiful vintage look! Love what you did here! Great card!